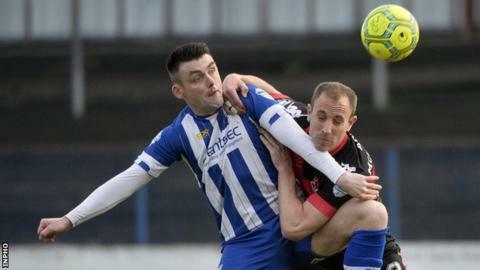 Irish Premiership clubs Crusaders and Coleraine begin their Scottish Challenge Cup campaigns on Saturday. League champions Crusaders are away to Queen of the South in their second round tie while Coleraine host Highland League outfit Fortmartine United. William Murphy, Trevor McKendry and Paul Owens take charge of Coleraine this weekend after Oran Kearney moved to become manager of St Mirren. Crusaders reached the semi-finals of last year's competition. The Challenge Cup features clubs from Scotland, Wales, Northern Ireland and the Republic of Ireland, although two English National League sides, Sutton United and Boreham Wood, will also take part this year. Fortmartine hail from Pitmedden, Aberdeenshire, and are managed by former Celtic player Paul Lawson, while Queen of the South lie third in the Scottish Championship. The competition is in its third year but this will be the first time that 2017-18 Irish Cup winners and Irish Premiership runners-up Coleraine have taken part. Last season Crusaders defeated Motherwell Under-20s 3-2, Cove Rangers 3-0 and Dundee United away 2-1 as they progressed to the last-four stage. Stephen Baxter's side lost out 3-2 to eventual winners Inverness Caledonian Thistle in the semi-finals. A 3-0 defeat by Coleraine on Monday night left the Crues languishing in what is for them a lowly seventh place in the league. "We want to bounce back and find a bit of rhythm - the lads always give 100% effort and we'll give of our best again on Saturday against Queen of the South," said Baxter.